Or, Foodie Fun Day Stop 1!! My friend Ian and I decided what we really needed was a afternoon of eating our way around Joburg. As you do. First stop was Stanley Beer Yard for some rather delicious sausages and craft beer! 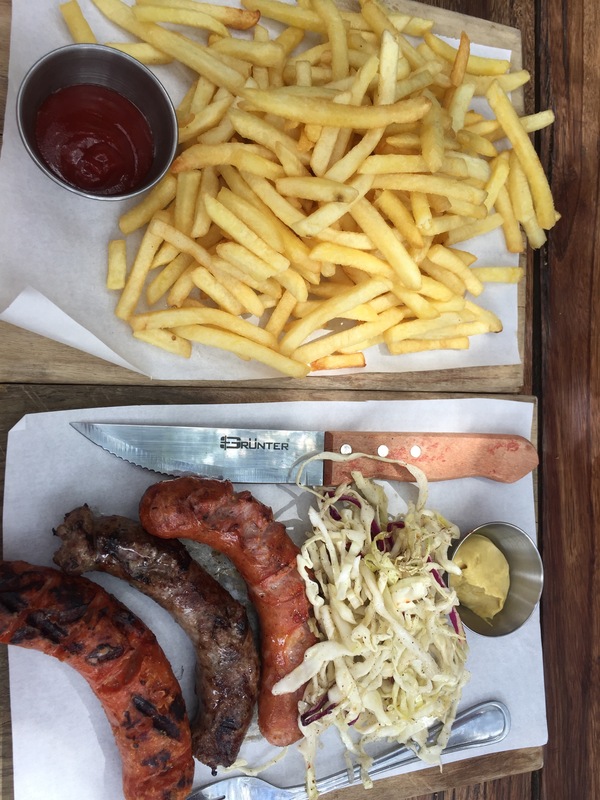 Joburg’s food scene is turning into hipster heaven, so naturally I had to go an explore. Not that I am a hipster of course… just because normally the good eats are where the man-buns and beards are found! We did look around first to decide which trendy food place we would stop at, but I’d heard about this sausage platter and had really decided that it needed to be done. I mean… cheese in sausages!? Why wouldn’t anyone want to try that?! Stupidly we also decided to order a “small” side of fries. They don’t understand the concept of small. We don’t understand the concept of leaving good fries behind!!! It was good though! Sat on rustic beer garden tables (the Brits will understand what I mean), on a busy day you could be sharing the table with anyone! It works though! It’s funky and fun, and somewhere you could totally imagine spending a lazy Sunday afternoon! Stop 1 set the bar high for the rest of the day! Chips and sausages. There is no bad here.